We all know China has pollution issues but now they are effecting the new Shanghai Disneyland. 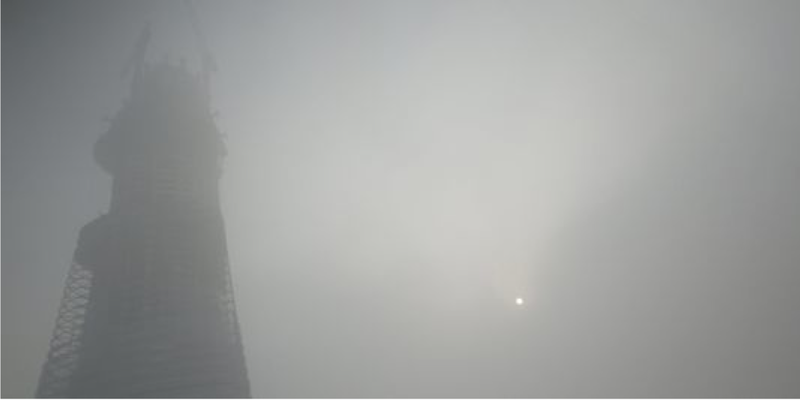 The picture to the left was taken yesterday, when Shanghai went under a severe smog warning. Causing a ban on all fireworks, the shutdown of 30% of government vehicles and stopping construction on the new Shanghai Disneyland property. It seems that these smog levels are mostly a problem during the winter months in Shanghai but have been known to happen anytime during the year. This makes many stop and question Disney's logic in building a theme park in an area with so many problems, pollution problems which could cause health issues and illness of visitors. While many will say those in Shanghai and China are used to these issues, Disney often brings in international visitors. Many of whom would find these kinds of conditions abhorrent. It also makes one wonder what will happen when the park is open and these conditions happen? Will they close or remain open? More so when their grand opening is set for December of 2015.